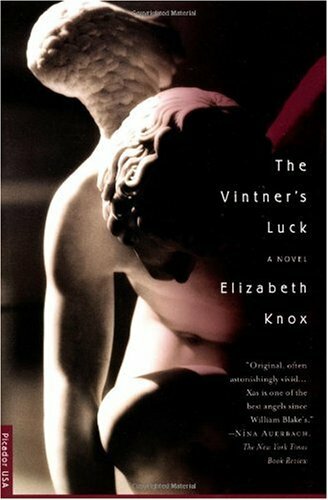 Heather at Raging Bibliomania and I read The Vintner's Luck together. We decided to do something different than the conversational joint reviews- instead, we're just posting each other's reviews! So below is Heather's review, and my review of the book is over on Heather's blog. Check it out if you have time! Sobran Jodeau is an eighteen year old boy who is finding himself unlucky in love. Deciding to drink away his troubles one clear summer night, Sobran drunkenly stumbles and falls upon the hill by his home next to the family's vineyard and is unexpectedly caught and set upright by an angel. To Sobran, an apprentice vintner, the discovery of an angel is full of delight and wonder, and soon the angel, named Xas, is giving Sobran advice about all the elements of his life, large and small. As the two begin to share secrets about their respective lives, Sobran finds that Xas is a patient and understanding creature able to discuss many topics of both practical and spiritual nature. Sobran and Xas feel that there is much to learn from one another and much to share, so they decide to meet once a year on the hill near Sobran's cottage. As Sobran ages like the fine wines he creates, he marries, fathers children, goes off to war and deals with tragedy. Xas shares his friend's joys and heartbreaks, gently advising and shaping him along his path. Spanning 55 years of Sobran's adult life, Xas becomes a vital part of Sobran's history, weaving himself into the tapestry of Sobran's past and future. But Xas has a story as well, and as he marks the years with Sobran, he begins to reveal the intrigues of his unusual journey from Heaven and his travails on Earth. Unexpectedly moving and singularly unique, The Vintner's Luck is the story of the touching relationship between an average man and an extraordinary angel. I was so glad to be able to read another book by an author that hails from New Zealand after having read The Bone People by Keri Hulme. Though the two book were very different, I think that there were a few similarities. One of the things that seemed common to both books was the lack of embellishment in the writing style. Although both books were plenty descriptive, it seemed that both authors preferred to keep things simple and left the language largely unadorned. The effect made the narrative blunt and abrupt and put the majority of the focus on the characters and what they were going through. It was a technique that I haven't seen used a lot, but I felt that in the case of this book, it was successful. There were a lot of large issues tackled in this story. Who is God, and is He really who we think He is? What is God's responsibility towards His creations? And how much of a say do we really have over the lives we live? All of these things were cleverly folded up into the narrative and probed by Xas and Sobran as they met for their yearly summit on the hill. The book asks some big questions and gives you something to think about as Sobran grows from a wild youth into a careworn old man, with the immortal Xas trekking his way from Heaven to Hell and everywhere in between. I wouldn't exactly say that this book is framed from any particular religious standpoint because it really takes a lot of the notions about God and flips them on their heads. Instead I would say that this book examines God from a spiritual perspective, where all the roles are reversed and some new and interesting ideas are brought forth. One of the things I asked myself while reading this book was weather or not the God being described in this book was a force of good or one of ambivalence. I was forced to conclude that God as portrayed by Elizabeth Knox was, to some degree, uninterested in most of His creations that had not attained perfection and was constantly striving to distill the perfect person or set of persons. Though I don't adhere to this belief system, it was interesting to play what-if with the book and get to see things from a different perspective. I did have a hard time with the characterization in the book. Aside from a handful of people, most of the characters seemed interchangeable. A lot of them were not even physically described, and for the most part, they all had the same narrative voice. I got lost by the fact that the book was populated with people that I couldn't identify, and due to their insubstantial renderings I sometimes had a hard time even remembering who was who. I debated with myself whether the author may have done this on purpose in order to make other characters stand out in more relief or whether this was one of the legitimate flaws of the book. After thinking about this for awhile, I am forced to admit that I think it was definitely the latter. I can only conclude that the author had trouble fleshing out the people that surrounded her main characters. I was surprised by the plot and the places that the narrative of this book took me. From Heaven to Hell, from discourses on God to discourses on Lucifer, from forbidden and strange love affairs to murder, there was a lot going on here. I think that one of the reasons I responded so positively to the book was because of the oddness of the story. There was no way that I could pin down what was going to happen next, no way to discover just what the author was next going to do, and this not only excited me but kept me engrossed deeply in the story's clutches. I found myself wondering where it would all go and wondering what would next happen to the beloved angel that I had come to know. I think that Xas was the best part of the book and found myself immersed in his life, his heartaches and his hurts. Though the other protagonists that he shared the spotlight with were interesting, I had most of my attention settled comfortably on him throughout the tale and felt that getting the chance to see things through his eyes was very refreshing and interesting to me. I will admit that I think parts of this book went over my head. Some of the religious allegories and symbolism were not easy to pick out, and I know I had a difficult time identifying the unifying themes of the book; but all in all, I would have to classify this book as a rich and rewarding read. Though the characters and writing were at times sparingly described, I found that there were a lot of thoughtful moments in this book and I really got caught up in the story of the angel and what he came to mean in the life of an everyday man. If you are the type of reader who is looking for a literary read with a complex and involving plot, I would definitely say this is the book for you. A great book that will definitely stretch your mind and engender some thought provoking discussions. Recommended! Now head over and read my review on Heather's blog! This sounds like a book I'd enjoy to read, although the characterisation might be a hard thing to deal with at times. I had to put it on my wishlist though, since a book that deals with religious issues always catches my interesest. I can imagine how you feel though, I'd struggle with books that have a lot of symbolism in it and feel I might be missing something. What a good, balanced review! I've had this book on my shelves for ages and I keep meaning to get to it but other books push ahead. Thank you for encouraging me to pick it up! Great review, it definitely sounds like something I would like, though, too bad about the other characters in the book being so flat. I am off to read your review now Aarti! Aarti, it was really nice reading this one with you. You have a way of making me see things from a different perspective and teasing out subtext and meaning from the books we read. It was a wonderful experience to share this book with you! Unusual, I like the sound of it and will keep an eye on it! I am just going to respond to these comments, even though they're all technically for Zibilee! Iris- Yes, it's definitely a great read for religion and symbolism! litlove- I look forward to seeing what you think of it. Amy- I think the other characters are somewhat flat only because the main three loom so large. Zibilee- It was, of course, FABULOUS to read this with you and discuss all the parts that confused us! I can see I need to read this again. It's a deceptively fast book. I got the impression it set out to convey a feeling of time, change, and the transience of a moment in history and a human life, and that that was why the secondary characters got left by the wayside. It didn't bother me too much because I took it as intentional. Somehow I hadn't realised that the religious themes in this book were so prominent. That doesn't make me NOT want to read it, since I find religion extremely interesting, but as my knowledge is so limited I worry I'll miss a lot of the symbolism too.